Electric Meat Grinders from One Stop Jerky Shop are built to last and will provide years of service. Brands such as Tasin and Weston Brands are some of the leading grinders on the market. 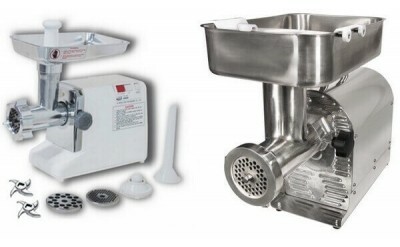 Our Electric Meat Grinders are able to grind meat as well as soft bones such as those found in chicken, rabbit and even turkey when using the large commercial grade meat grinder. Electric Meat Grinders make very fast work of any meat processing job you may have. perfect for the home meat processor.